Even though Smart thermostats are perceived to be very expensive gadgets, there’s always something for everyone. Most homeowners stick to their regular thermostats fearing that Smart thermostats may break the bank. To some extent, this notion may be right and in the same token, it is a very wrong perception. Even though we all believe that the higher the price the better the performance, you can still get a cheap thermostat that will help cut the huge energy bills just like these high-end Smart thermostats. For a clear and concise perspective, we decided to put the most expensive Smart thermostat against a cheaper alternative and see how they battle it out. 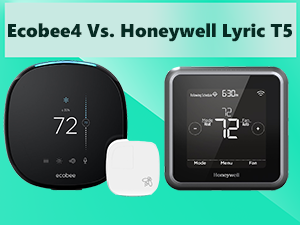 So, without further ado, here’s the Ecobee4 vs. Honeywell Lyric T5. Works with Amazon Alexa-"Requires C Wire"
Room sensor compatible. Comes with one free. Uses room sensors, local weather and your schedule to deliver cost savings and comfort. What Makes the Ecobee4 Different from the Lyric T5? Lyric T5 vs. Ecobee4: What’s the Best Smart Thermostat? 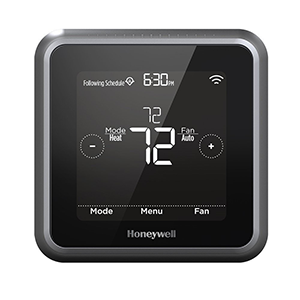 Just like Ecobee and Nest, Honeywell is also a household name when it comes to Smart thermostats. Even though it is best known for its prime thermostat, Lyric Round, the Lyric T5 is also a force to reckon majorly because of its affordability. This Smart thermostat features a unique 7-Day Flexible Scheduling and Geofencing which has been hailed as the industry’s leading. Besides, it is compatible with Google Assistant, Amazon Alexa and even Apple HomeKit. What I like most about this thermostat is its price. While the likes of Nest Learning and Ecobee4 retail at almost $250, you can now start saving energy with the Lyric with just $100. On the downside, this Smart thermostat doesn’t display weather and can’t measure humidity like the Ecobee4. Worse enough, it lacks motion sensors and relies only on the proximity of your Smartphone. Besides, Smart integrations are limited to Alexa and HomeKit only. Even though Nest Learning is such a top player, the Ecobee4 remains my favorite Smart Thermostat. What makes it such a dear to me is the fact that it has remote sensors for a more precise temperature reading and consequently, the right HVAC adjustments. This feature makes it an ideal Smart thermostat for homes with many rooms. There is also a proximity sensor that lights up the display when you near the thermostat. Besides this, it is compatible with Amazon Alexa and Apple HomeKit. In fact, you can talk to it and it will surely respond. Together with the Smartphone App, Alexa and HomeKit make the Ecobee4 a great gadget for the old and also, those with mobility complications. What puts me off is the fact that it lacks the Learning feature. This is a real bother for me because, for the same price, I can get the Intelligent Nest that learns my lifestyle giving it the intelligence for self-programming. The set-up is also a big problem, especially for amateurs. 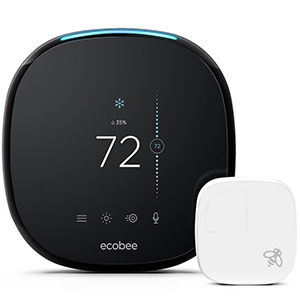 The Ecobee4 and Lyric T5 both have Geofencing. However, there’s some slight but noteworthy difference in their approach towards Geofencing. While the Ecobee4 uses smart sensors, Lyric uses the proximity of your phone App. From my experience with the Ecobee3 as well as Ecobee4 and even Nest, I think there’s so much to be desired. With these thermostats, the radius was very small unlike in Lyric. I haven’t used Lyric for long but I must commend its range. It determines whether you are home or not by using the range of your Smartphone. The results are very accurate; the only shortcoming is that when you forget your Smartphone at home, it will assume you are still around. Besides, it supports multiple users which is a very big plus for such a cheap Smart Thermostat. Another area these two Smart thermostats are different is in terms of accuracy and performance in general. I am not saying the Lyric T5 has bad performance but Ecobee4 is just superior. Ecovee4 guarantees precise temperature readings in every room courtesy of the remote sensors. Consequently, it adjusts the HVAC system according to each room’s temperature for a more comfortable stay and most importantly, to cave energy. This is why I recommend the Ecobee4 for storey houses or a building with many rooms. The T5 lacks this feature even though it still offers some impressive performance. However, I have a problem with it when it comes to storey houses that have higher temperatures on the ground floor and lower temperatures in the upper floors. It tends to assume all floors and rooms have the same temperature. There are times when you are certain about the weather for several days straight. For this reason, Honeywell engineered the Lyric with a 7-day schedule function. With this feature, you can easily set your preferred temperature depending on the weather you are anticipating. Of course, you can do this on the thermostat’s touchscreen LCD or the Smartphone App. This is among the areas Honeywell beats Ecobee. The Lyric T5 has been engineered to note down the time it takes the HVAC to achieve the desired temperature. It learns from a series of time frames before adapting itself and making specific preset times for more accuracy. However, this feature shouldn’t be confused with Smart Learning as is in Nest Learning. These two Smart thermostats retail at very different prices. While Nest and Ecobee4 were focusing on engineering on a cool Smart thermostat, Honeywell was making a really cheap Smart alternative that would serve the low-budget homeowners. 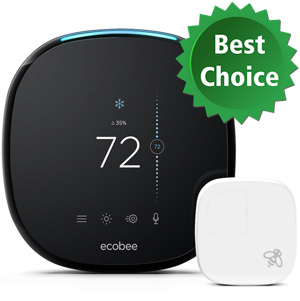 The Ecobee4 retails at around $250, same as Nest Learning while Lyric T5 retails at around $100. It’s not that I’m complaining but Honeywell should have improved a few things in Lyric. First, it would have been better if it has sensors for occupancy detection. This feature is more reliable considering when you forget your Smartphone in the house; it will not shift to Away mode. When it comes to Ecobee, I would only love to see a high-quality speaker than what we currently have. Installation could also be made easier as most people feel the weight of having to call a technician for such a small task. This is a problem that the predecessor, the Ecobee3 got criticism from. It is evident that the Ecobee4 is the best Smart thermostat in this Lyric T5 vs. Ecobee4 comparison review. This is because it cuts energy costs by 25% compared to the 18 – 20% the Lyric cuts. So, if you are after lowering your energy costs, the Ecobee4 is the best. On the other hand, if you are not comfortable with the $200+ price tag of the Ecobee4, the Lyric T5 is still a great purchase as it offers almost the same energy bill reduction. Besides, it comes with a schedule function for user convenience and its Geofencing capability is more accurate.